Not everyone likes spiders, in fact many people are rather frightened of them. Peacock spider, on the other hand, looks majestic. The beautiful scales shining on the rainbow peacock spider’s (Maratus robinsoni) back, shine like a rainbow. This, the world’s smallest rainbow display, could inspire various changes in optical technology as we know it. As mentioned, peacock spiders wear glimmering, colorful scales on their rear, which are designed in a way to attract female spiders, similar to the way peacock birds flaunt with its beautiful feathers. Peacock spiders are small to the point that the biggest species can grow up to as “huge” as a pencil eraser. Furthermore, if the world’s smallest rainbow on their back is not enough to attract females, they entice them with a mating dance. Scientists across various institutes and universities around the world conducted the study on how those scales could contain “nature’s smallest rainbow,” and published the study in Nature Communications. The team of scientists used electron microscopy and optical modeling to see the iridescent backside of the spider. They then used an advanced nano 3D printer to print out detailed scales with different properties from the spider’s scales to find those that create the iridescent shine. Researchers discovered that the curved shape of peacock spider scales makes the iridescent glimmer, and by interacting with small surfaces on the scales they separate and isolate light and reflect it at different wavelengths. Humans can see those wavelengths as the colors of the rainbow. Humans can make rainbow iridescent materials, although scientists have never been able to do it on such a small scale like those of the peacock spider. That allows scientists to use biomimicry to create new useful structures thanks to the world’s smallest rainbow on spider’s back. Biomimicry, also known as biomimetics, is the technology in development inspired by the structures and processes found in nature. 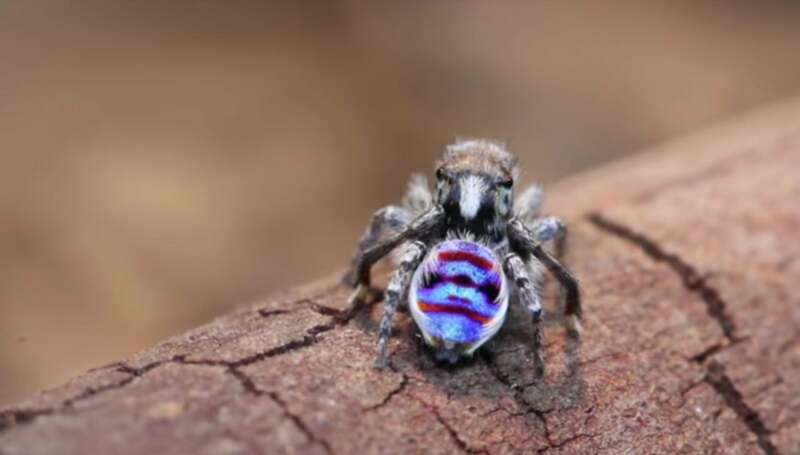 According to the press release about the peacock spiders, the discovery of their complex scale structure may inspire a lot of development in technology and optics, thanks to their iridescence. “Who knew that such a small critter would create such an intense iridescence using extremely sophisticated mechanisms,” said study co-author Dimitri Deheyn, a postdoc at the Scripps Institute of Oceanography, in the statement. “One of the main questions that I wanted to address in my Ph.D. dissertation was ‘how does nature modulate iridescence?’ From a biomimicry perspective, to fully understand and address a question, one has to take extremes from both ends into consideration. Hence, I purposefully chose to study these tiny spiders with intense iridescence after having investigated the non-iridescent blue tarantulas,” added Dr. Bor-Kai Hsiung, postdoctoral scholar at Scripps Institution of Oceanography at the University of California San Diego.